I am on a mission to become proficient with keyboard shortcuts, and I keep cheating by accident and using my trackpad. I want to be rigorous in my attempt to learn, so how do you toggle the trackpad on and off? I found information on how to turn it off if you use a mouse, but that defeats the purpose of what I am trying to do. In the spirit of learning keyboard shortcuts, if anyone knows how to set a keyboard shortcut to toggle the trackpad, that would be optimal. To turn off the track pad you’ll need to attach a mouse or wireless trackpad but you don’t need to use it. Not the answer you're looking for? Browse other questions tagged macos keyboard trackpad . 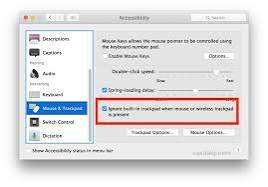 Disable trackpad handwriting keyboard shortcut without disabling Chinese keyboard input? Why doesn't my MacBook Air turn off?